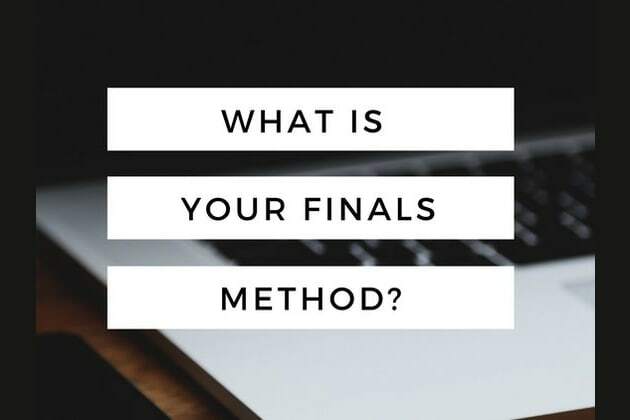 What Is Your Finals Method? Where can you be found during finals week? Do you handle tests well? You probably have all of your notes color coded and organized by dates. You have spent Thanksgiving break creating your finals schedule. Perfectly organized and armed with a array of pens and highlighters, friend come to you when they need a study buddy. You will pass all of your finals with flying colors--no sweat. Finals is the worse time of year for you or any other stressful time. Your finals strategy consists of melting into your bed and wondering how you will make it through life. Take a deep breath and calmly study. Don't let your nerves get the best of you! Finals? Do those things still happen? For some reason you are calm, cool, collected, and barely concerned. Finals are no stress for you for whatever reason. It is just another week before going home for Christmas. You are the average student without many hang ups. You may have your times of panic, apathy, or studiousness, but at the end of the day you are just trying to pass this semester. Being in the middle is almost as good as being a studious student! Finals are fast approaching. Take this quiz to find out how you deal with finals. You may possibly be able to fix mistakes before the dreaded week!